As winter approaches, we're wrapping up warm and turning on the heating. We all know the feeling of stepping outside and the shock of cold air hitting our face and lungs; some of us love it but others shiver at the thought of leaving the house! Our pets' reactions to winter weather will vary between individuals but whether they are going out for a toilet trip or a frosty walk with us, there are things we need to bear in mind during adverse weather conditions. When we go outside, our fingers, ears, noses and toes suffer the worst of the cold and it really isn't very different for our pets. While their dense fur and toughened paw pads give them better protection, prolonged periods in the wet or snow, salt gritted paths and anti-freeze chemicals negate these adaptations to the cold. Going between a warm house and the cold damp garden can mean trouble for your dog's skin, as it changes the moisture levels and natural balance of bacteria on the skin. Dryness, itchiness and flaking can occur, and for dogs with existing skin sensitivities, conditions can be aggravated. Shampooing strips the natural oils from the skin, so it should be avoided unless absolutely necessary. If you do need to bath your dog, make sure you use moisturising products such as an oatmeal shampoo. Jumping around in muddy puddles or even walking on the wet pavement will leave your pet with very soggy fur, so always use a clean damp cloth or pet wipe to remove dirt when you get back in, and gently dry between their toes to reduce risk of infection. Remember to check their ears regularly for signs of redness or discharge, again gently drying the underside of the ear but never put anything like cotton buds into the ear canal. It can be worth speaking to your groomer about trimming long ear hair to help improve air flow and reduce moisture retention. Our best-selling ear cleaner is RestAural - gentle enough for every day use, it removes wax, dirt, and dries the ear canal to minimise risk of infection. Smaller dogs and shorter haired/ hairless breeds will lose heat and become cold much quicker than larger dogs and those with longer, thicker hair. You should get to know your breed and their tolerances, although they will make it quite clear which one they prefer; a relative of mine has always had chow chows, who were often reluctant to come inside in winter and then spent their summers on the cool kitchen floor! Be on the look out for cats seeking shelter from the cold. Check under your car and even the engine before driving off- a warm engine is so tempting for a chilly cat! Longer haired breeds commonly have problems with snowballs forming on their lower legs and even bellies, hindering movement and causing pain if left around the paws especially. If your dog has this problem, clipping their feet or even lower legs will help greatly and help their paws to dry quicker. Long claws can cause the toes to spread when walking, so make sure you keep up regular trims to help reduce the amount of snow that builds up between the toes and pads. It is better to take shorter walks when it is snowy to minimise the chance of frostbite (although rare it does happen). Remove snow from their coat and paws when you get back inside and wipe paws with a cloth. If your dog suffers from joint problems, cold weather can make stiffness and pain much worse. Keep trips outside short and if they need it, consider setting up a ramp or shorter non-slip steps into your garden if you have a large step at your doors. There are a range of coats and jumpers available that will help to keep their joints warmer for longer outside too. Ensure they stay warm inside with extra bedding or even treat them to a heated pad! Continue to keep an eye on their weight- obesity increases the pressure on joints and promotes deterioration. 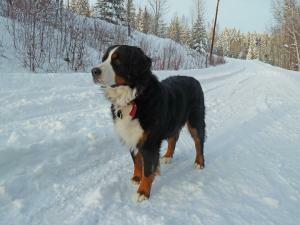 A covering of snow masks the scents your dogs will often follow, and familiar paths may become undetectable. If your dog is off the lead or gets out of your garden, they might not be able to find their way back as everything will look and smell different. Your pets should all wear collars with their name and your contact details, and be micro-chipped to give the best chance of being reunited should they be found by someone else. Keep your dog close when walking them near iced over water. If they were to fall through ice into deep water, their body temperature would drop quickly and they would tire easily while struggling to get out if you can't reach them to help. If you have a pond in your garden, fence it off during winter to reduce risk of any animal walking over the surface and falling in. Ice causes numerous problems for human transport and tonnes of salt are spread on roads and paths in an attempt to melt the ice at lower temperatures- harmless to tyres and our thick soled boots in winter! Though their pads are toughened, salt and other chemicals used to melt ice cause the skin to dry and crack and may even cause chemical burns. The salt itself can cause cuts and grazes on pads and between toes and anti-freeze solutions are toxic (but tasty!) when licked off paws and ingested. Don't let your pet lick its paws before you have wiped them down and removed snow, salt and chemicals they may have picked up on a walk. Jackets and coats are a great way to keep your dog dry and warm in the winter and helps to keep their coat clean so you don't get that 'doggy' smell after a rainy walk. There is a wide selection available, from high visibility for night-time safety, to festive patterns perfect for the Christmas period. For those of you who are particularly active with your dogs, it may be worth investing in some Hurtta dogwear, known for its high quality and durability, it won't let your dog down! Protect your dog's feet from harmful chemicals, the freezing ground and prevent snow from becoming compacted between toes with some dog boots. These are particularly helpful for dogs who have sensitive skin as they provide a physical barrier. Easy to put on, remove and clean! To keep your dog's paws supple in winter, use a nourishing paw butter indoors. For outdoor protection try a paw wax which prevents chapping and gives better grip - great for preventing painful slips and jolts in elderly pets. While you can wash their paws, wipes are easy to use and portable, ideal for use before loading your dog back into your car after a mucky walk. Also remember to check your dogs collars/leads regular during the freezing weather for any cracking, replace if any cracking appears. Grateful Thanks for all your advice. It really does help. Me wee dog will be wearing wee boots this winter.